A few days ago I and my colleague Wesley had a lot of problems installing of Team Foundation Server on Windows Server 2008 with a Separate SQL Server 2008 and SharePoint Farm. After a couple days of hard work we finally got it running. When we completed the installation we began testing it on our local systems. On our local system everything went fine but when we tried it on a Virtual Machine that we use for developing solution for SharePoint we could not connect to the Team Foundation Server. 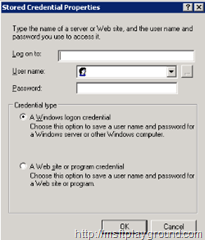 The problem here was that the Virtual Machine has its own domain so the account that you are logged in with could not authenticate to the TFS server. 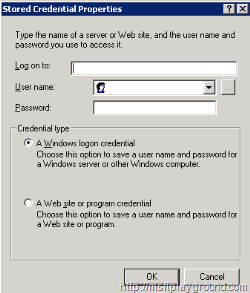 2: In the Control Panel select User Accounts. 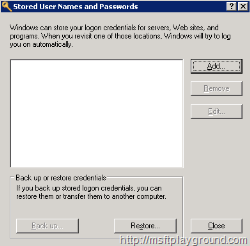 3: On the left side of the screen select Manage your network passwords. 4: Click add and insert the right information. Try connecting to the Team Foundation Server again. Now everything should work perfectly.